You may have heard about a little outfit called “Irrational Games” whose members can claim varying degrees of responsibility for scary and suspenseful titles like System Shock, Bioshock, and the Thief games. 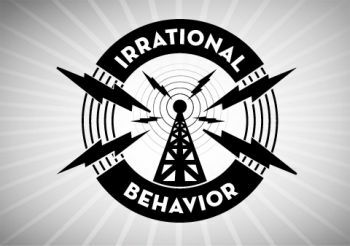 They do a semi-regular podcast about their games called “Irrational Behavior” that is a bit like a cross between “This American Life” and Grand Ballroom C at a tourettes syndrome convention. It’s great. Fear is arousing. Arousal in and of itself can be enjoyable or attractive if we’re bored or if we’re the type of person who likes to be more physiologically aroused. And fear certainly can do that. Experiencing mediated fear gives us the opportunity to experience fear in a controlled way. Where we have the potential, at least, to master our fears, to control threats, in a way that we can’t in real life. And he goes on. In addition to that, there are interviews with some of the artists at Irrational Games about how they create a sense of fear, and it seems that these folks have as good a grasp on the subject as any psychologist. It’s a good listen. Click here. Shawn also goes around the Irrational Games offices quizzing people on what they’re afraid of, and some of the answers are pretty funny. By the way, if he had asked me, I would have said “Jupiter.” As in the planet. For some reason the thought of something that big, that far away, and that alien scared me as a kid. I still tense up just a little bit if I see a picture of that particular planet. What about you? What are you afraid of? Has it ever showed up in a game? Up until last year, I was deathly afraid of Space Mountain at Disneyland. When I was 5 or so, they opened the ride, and the commercial they used was terrifying to my developing mind. So much so that every time we went to Disneyland and I saw the mountain, I could feel my heartbeat rising- well into my 30s! But last year, my 7 year old daughter wanted to get on it, and rather than have her think her Dad was a big wuss, or rather than have HER develop a fear of rides and become the kid that doesn’t want to get on thrill rides, I faced that fear and got on it. I’m happy to say that I survived. I remember trying to play Myst back in my young days. It scared the hell out of me; being by yourself all alone in one island where nothing makes immediate sense. I could only touch it again one or two years later. That’s the strongest “scary” game experience I ever had. Other than that, titles we’re used to see when the subject is fear and terror: Silent Hill, Doom, Alone in the Dark and the whole pack. I’m wildly afraid of heights and enclosed spaces – I have been for as long as I can remember. With the release of Steam for Mac I was finally able to play Portal for the first time last night and found myself slightly horrified to jump 40 feet into a portal, only to be launched another 40 feet in the air by the exit portal. It wasn’t the same fear I feel in real life, but thinking about it in terms of “what if this WAS real?” was super scary. F.E.A.R – Never finished it. Couldn’t go into the water. Just couldn’t. Despite knowing and being told that there was, in fact, nothing in there.. Sort of. A video game made me scared when I was 5. The original NES Ninja Turtles game had top-down sections where you had to cross the road in front of spiky tanks or something. I frequently got squished. Started to hate these sections, then fear them… then had a nightmare about evil foot soldiers running me over in a tank that I still remember vividly. I actually just wrote up something about a fear experience brought on by the game ‘The Path’ which caused me to recollect a seminal gaming moment in my life – my first video game induced fear reaction. Sierra’s “the Colonel’s bequest” caused the fright, it made the experience much more arousing (plus it was a ‘shower scene’, which was probably already arousing to my 12ish year old self). I know that after getting scared I stopped playing the game for a spell, but I did also return and in the end it was one of the few Sierra games I beat more than once. Hrmm.. I should go write more about this. As always your blog is a stimulating read. Thanks! by far, the most visceral game fear i’ve experienced was the Marine campaign in Alien vs Predator. they nailed the sound (dripping water and OMG the haunting blips of the motion-scanner!) and i found my heart-rate POUNDING during those missions. in real life, radioactive waste and human trafficking is about as fearsome as it gets. Im very very afraid of deep waters in real life,and i cant go to swim in ocean where i cant see what is under me.The same fear presents itself whenever there is an under water level involved(the latest indiana game comes to mind,that game had waaay too much levels under water). I am actually curious to know if this phobia can be healed? I played Neverwinter Nights on a popular Persistent World server called “Arelith”. The server features a permanent death option after 10 deaths of your character. I ran from battle so many times, . When battles were REALLY close calls I could feel my heart pounding BAD. But I might consider that more of a THRILL feeling rather than a FEAR feeling. I played Resident Evil Code Veronica at my friend’s house a long time ago, and I remember that being the most afraid I was of a game. My friends around me were falling asleep, and eventually at 3am I was the only one awake, with the game. The camera angles in that game seemed to imply that something was coming, and I would start to anticipate zombies popping through windows when I walked by them, even though they really only did it once in awhile. When I first played the original demo for DOOM it made my heart pound and sent chills down my spine. It was at that moment I realized that if I actually bought the game I would play it to the exclusion of all else and never finish school. Submarine games, like 688 and Sea Wolf. These tend to have long, tense periods of waiting, punctuated by a few moments of terror when the incoming torpedoes show up on the Sonar display. [Portal spoilers forthcoming] In real life, the concept of going “outside the lines” in a physical space is frightening to me. For example, take the Jurassic Park log flume ride, or the Jaws boat ride at Universal Studios. It’s a bunch of silly fake dinosaurs/sharks in a shallow pool of water. But the idea of getting out of the boat and having to walk/swim around on the “sets” is terrifying (it’s the same with non-water rides but to a lesser extent). This feeling even extended recently to a Wal-Mart parking lot experience. I was driving around the back of the building to a back exit, through the places where trucks unload etc. You are allowed to drive there – but this time there were actually some trucks there maneuvering, and it was like I didn’t belong there and was outside the lines of where I was “supposed to be” as a non-Wal-Mart worker. I wasn’t exactly “scared”, but there was certainly a physical and mental response. [Portal spoilers in this paragraph] I got a very similar feeling from Portal once I started going behind the scenes and disobeying GLaDOS. Even though the “controlled” areas were dangerous and I was targeted for death, it felt safe. Going into those back rooms beyond the controlled area was frightening.